Last week we announced a partnership with Clavister that involves packaging Clavister’s security products as secure cloud services. This includes products such as Clavister’s Virtual Next Generation Firewall and Identity Management. 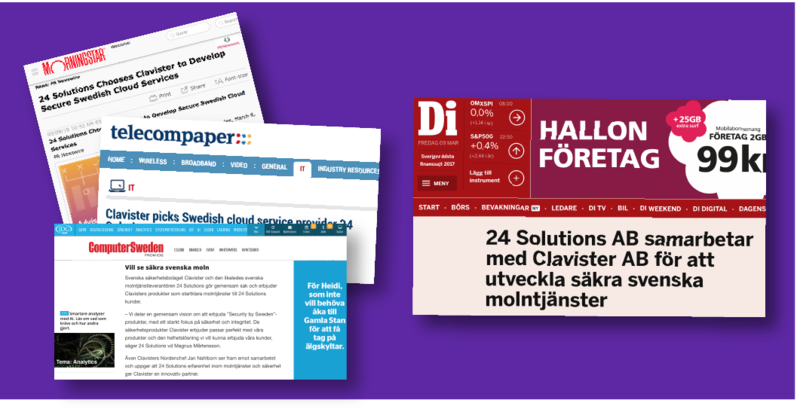 The partnership strengthens 24 Solutions and Clavister’s vision of delivering ‘’Security by Sweden’’ solutions, and fits perfectly into our overall value proposition. The partnership was highlighted by both Swedish and international media outlets. In Sweden, Dagens Industri published the press release and Computer Sweden also featured the news.